Ruth Krauss was born in Baltimore, Maryland and graduated from the Parson School of Design in New York City. During the 1940s, she was a member of the Writers' Laboratory at the Bank Street College of Education. In 1943, she married Crockett Johnson, a children's book author and illustrator. They collaborated on many books for children, among them such classics such as The Carrot Seed (1945). Her book A Hole Is to Dig (1952) was illustrated by Maurice Sendak. She produced more than 30 books for children in her career and also wrote poems for an adult audience. 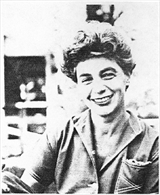 Ruth Krauss is currently considered a "single author." If one or more works are by a distinct, homonymous authors, go ahead and split the author. Ruth Krauss is composed of 5 names. You can examine and separate out names.